Love roasted root vegetables? Who doesn’t! Turn a humble bag of carrots into delicious roasted carrots, spiced and fragrant with cinnamon, cumin and ginger. 2. DICE the carrots into ½-inch thick pieces. Leave the skin on as desired. 2. MIX all ingredients together and bake at 400°F for 15-20 minutes, or until golden brown. Cumin is the dried seed of the herb Cuminum cyminum, a member of the parsley family. Its botanical family, Apiaceae, is also known as the celery or carrot family, a family of mostly aromatic plants with hollow stems. Caraway and dill are also members of the family. 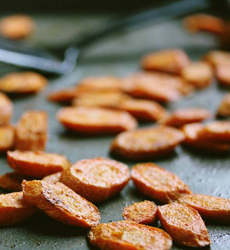 Top: Cumin-spiced carrots from Evolution Fresh. Bottom: Whole and ground cumin seeds. Photo courtesy Silk Road Spices. Cumin grew wild from the east Mediterranean to India, and is common in the cuisines of those areas. Seeds excavated in Syria have been dated to the second millennium B.C.E. Cumin seeds are also found in ancient Egyptian archaeological sites. 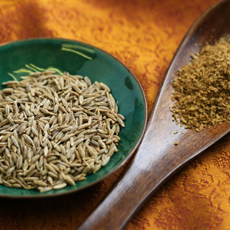 Flavorful and aromatic, cumin was popular throughout the ancient world. It is mentioned in both the Old Testament (Isaiah 28:27) and the New Testament (Matthew 23:23) of the Bible. The ancient Greeks kept cumin in a container on the dining table, much as we keep pepper today. Cumin was also used heavily in ancient Roman cuisine. In India, it has been used for millennia as an ingredient and is part of curry powder and garam masala spice blends. It is also added to other spice blends, including achiote, adobo, bahaarat, chili powder and sofrito. Cumin was brought to the New World by Spanish and Portuguese colonists, and has become a popular ingredient in Latin American cuisines. Several different varieties of cumin are cultivated today, the most popular of which are are black and green cumin.